Quickly following our wedding celebration in Christchurch, we hopped up to Nelson for a night. Becks' late grandmother was from Nelson and this was her first visit since Peggy had passed away last year. It is a great sadness to me that Becks didn't meet my late grandmother and I feel a similar, if lesser, sadness at never having been able to meet 'nanna'. Therefore it wasn't much surprise that (almost) the first the thing we did after arriving in Nelson was to go and pay our respects at the Marsden Valley Cemetery. We decided to walk from Nelson airport to Stoke which was quite a pleasant stroll once we'd managed to cross the highway. Being one of the hottest days of our trip, and already past lunchtime, we decided to have some lunch at the Stoke Bakery before going to the cemetery. It was the type of bakery you don't really see any more in the UK, independent, unmodernised and with a good range of no nonsense sandwiches, pies and cakes by the slice. After lunch we bought some flowers and continued our walk up to the cemetery. The large cemetery was well tended (much more so than cemeteries in the UK) and with the roses in full bloom it was looking lovely. They had a handy little touchscreen display you could use to locate the relevant plot number, and armed with directions, we went to find Peggy's grave. Back in Stoke we caught the bus across to Nelson and checked into our B&B. The website for the Baywick Inn is a bit oldy worldy and I thought we could be staying somewhere past its prime, but it was actually very lovely. The owners seem to have a deep passion for trinkets and memorabilia of the British Royal family and festoon the dining room with them. Staunch republicans might want to stay somewhere else. For dinner that evening we caught up with Becks' cousin Helen and her family. They had been at our wedding celebration a couple of days before, but it was nice to be able to spend some time catching up with them properly as we'd barely had the opportunity to speak at the wedding. Helen's daughters Piata and Mahina were incredibly sweet, especially seeing as they'd never met me before. The next morning after breakfast we climbed up in the drizzle to the "centre of New Zealand" which sits above Nelson. Only when we'd reached the top and I read the plaque did I realised it was a fraud. 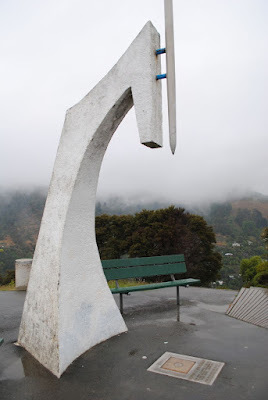 It isn't the centre of New Zealand at all, but the centre point of the Malborough region which is deemed the 'central state'. The people from Ordnance Survey wouldn't put up with such nonsense. Walking back down into the centre of Nelson we took a quick detour via Peggie's old house before going for a wander round town. If you'd asked me before we visited Nelson, I would have told you that I hadn't visited before, but seeing the cathedral tower it did look incredibly familiar and checking later with Ruth we had in fact spent a night in Nelson back in 2001. Apart from the cathedral tower I don't remember anything else about the town from my previous visit. After looking round the cathedral we stopped for a light lunch in the Sweet As café. Although we only tried a couple of things it was another - to my mind - classic Kiwi café. Small, independent, friendly, tasty and reasonably priced. 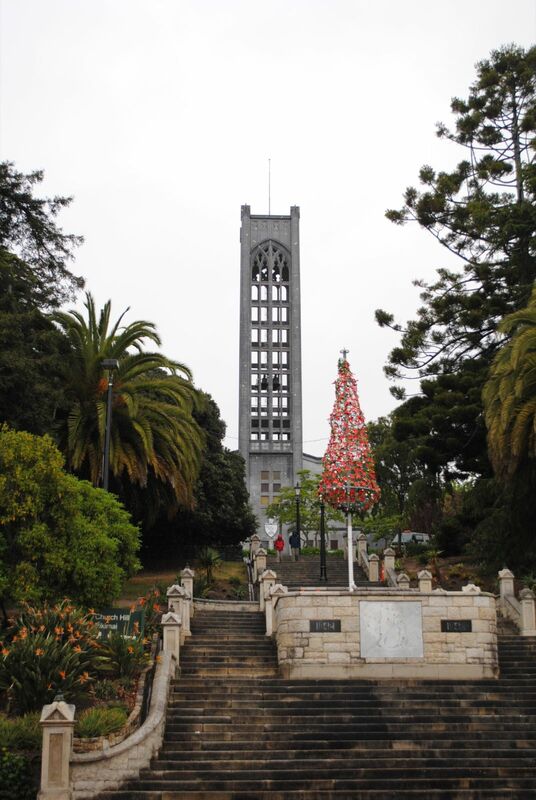 I sent mum and dad there when they visited Nelson around a week later who also enjoyed it. The only downside for me is the name, "sweet as". It is a bit of a bogan saying in Australia, although Becks tells me there are no such connotations in NZ. We had a further slow drift round town after lunch before collecting our bags from the B&B and catching the bus across to the beach for a quick paddle and walk along the sand. Feet dry and shoes back on we hiked back to the airport. I don't think there can be too many passengers who arrive and depart from the airport on foot like us.